A home cooked meal is one of my favourite things. Both Carl and I love cooking and it is only on the rare occasion that we will order in. Cooking fresh for us is best! 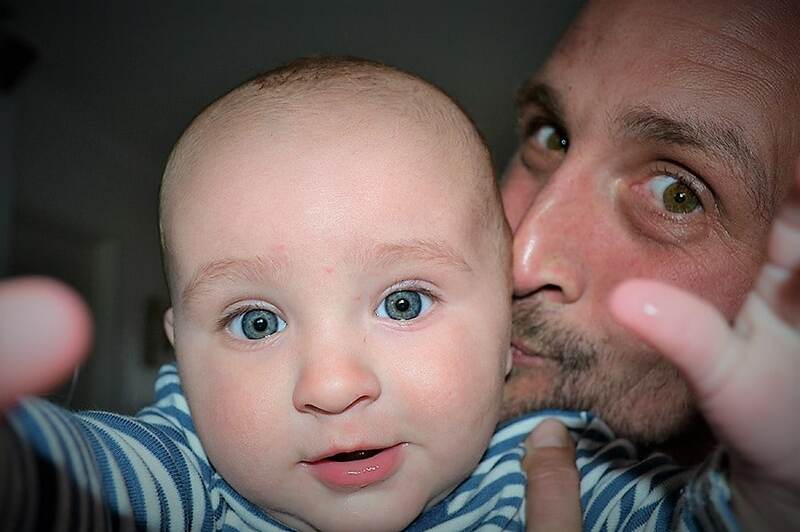 When our boy Kai was old enough to start solids, it was a very exciting time in our house and we experimented with lots of different flavours and taste sensations for him to get his little taste buds excited about what he was eating. Like his parents he has developed a love of all things food and will chow down on just about anything. Kai learned to walk before he was 10 months old and was an ever-adventurous spirit. The only way to cook meals was to involve him, otherwise he would be off. Unpacking our household, looking for things to climb, opening the front door or climbing up the burglar bars, he was busy, busy, busy! None of which we could just let him roam free to do while we were cooking. So, we encouraged him to participate in meal preparation which he just loved. Depending on the age of your child, they can help with different things. At around 8/9 months, Kai would just sit on counter (in a safe position) next to the breadboard where I would be chopping. He had free access to touch and taste everything I was cutting. If he mixed up all the ingredients, that was fine too. It was a fantastic sensory experience for him. Surprisingly one of his favourite things to eat off the chopping board at that age was onion. I think he liked how it felt in his mouth, all nice and juicy and crunchy. By sitting there with access to all the veggies, fruits, mushrooms and more, he experienced many different textures, colours, tastes and smells. When it was time to start cooking, I would put him in his ring sling and he would watch as everything was put into various pots and pans for cooking. As he got older, he started to help put some of the ingredients into the pans which he eyed with great curiosity as their colour and smell changed slightly with cooking. From around 14 months old, he was ready for his learning tower. All children develop at their own pace, so some may be ready for a learning tower a little earlier and some a little later. At 14 months old, he still needed a safety barrier in order to keep him safe and to prevent falls. 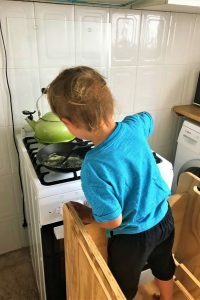 He now could start to help a little bit in the kitchen with very basic tasks such as picking herbs and food from the garden and peeling garlic. It would take an age for him to actually peel the garlic but, peel it he would, and it gave us time to quickly chop what needed chopping. While helping out, he would munch at least half his supper by helping himself to whatever was on the chopping board. It is a fantastic way for children to experience food without being under any pressure to try new things. He also loved smelling spices and would sit by our spice rack opening each bottle, smelling and learning the name of what he smelt. We just made sure that the spices were on the lowest pouring level, so he could not breathe them in while smelling. To this day, he still enjoys smelling all the spices in the house and adding them to various dishes. Next was learning how to cut, peel and grate between 16-18 months. He started out with a butter knife so he could not injure himself. We made sure he was always standing in the learning tower at the right level and facing the counter, not at an angle. If a child is sitting on a shelf and tries to help with cutting, their body won’t be at the right angle. That makes cutting a lot harder, and could result in injury. He started out cutting foods which were very easy to cut such as basil leaves, mushrooms, banana, strawberry then moving on to other foods such as onions, bell peppers, tomatoes and apples. 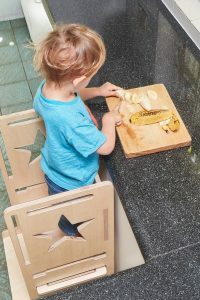 At 2 years and 8 months some foods are still a little tricky for him to cut, such as carrot or potatoes, but he can usually help peel or grate those. 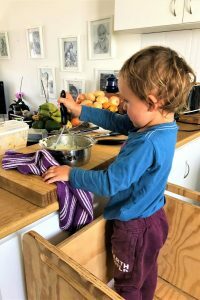 Whatever age or level of skill your little one is, letting them help in the kitchen is a truly wonderful experience. 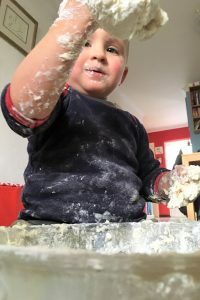 It is always a happy time when Kai gets a little better at using one of the many kitchen tools and seeing the joy on his face when he realizes he has managed to do something on his own after many days of weeks of little attempts. It’s just too gorgeous! I will never forget how proud he was when he first manged peel a carrot. The concentration on his face keeping his little fingers out the way to protect them. The laughter and excitement squeak’s that came bellowing out. The kind of moment every mother cherishes. Kai cooked his first scrambled eggs about two weeks ago. He was so excited to finally be able to cook something himself from start to finish. Cracking the eggs, beating them, cutting the tomatoes and adding a little feta, buttering the toast and using the spatula and pan he has watched mommy and daddy using for the past two years. All his little practiced skills to make one meal. He ate every little crumb of that meal and watched wide eyed as we ate it too. Too sweet for words. Your little one can start by just watching you cutting, chopping, baking and cooking. They will enjoy the smells sights of everything in the kitchen. When small the priority is to make sure you little one is safe. Remove any sharp items or choking hazards. Do not place them in an area where they could fall, access the kettle or any power equipment (blenders etc.) or close to any hot surfaces. If they are close to the chopping board. Never leave the knife you are using on the chopping board. This must be kept out of reach of your little one. Start naming everything you are cooking even if they can’t talk. This will help them learn the names of the foods they taste. Let them hold, smell and gum various foods in their whole forms. What a potato feels like is very different to what a red pepper feels like. This can be very interesting for a little one and can keep them occupied while you are busy. Just give them a wash before giving to your little one. If your baby is a little bigger and can eat the raw foods you are chopping, let them try everything. You (and they) may be surprised by what they enjoy and they will get used to a variety of flavours. Let your little one know what a big help they are. Even if they are just moving all the foods you have cooked from one side of the board to another. When small, you can take a few bowls out for your toddler to put the various ingredients in, once they have been chopped. Eg: tomatoes into one bowl, onions into another bowl etc. 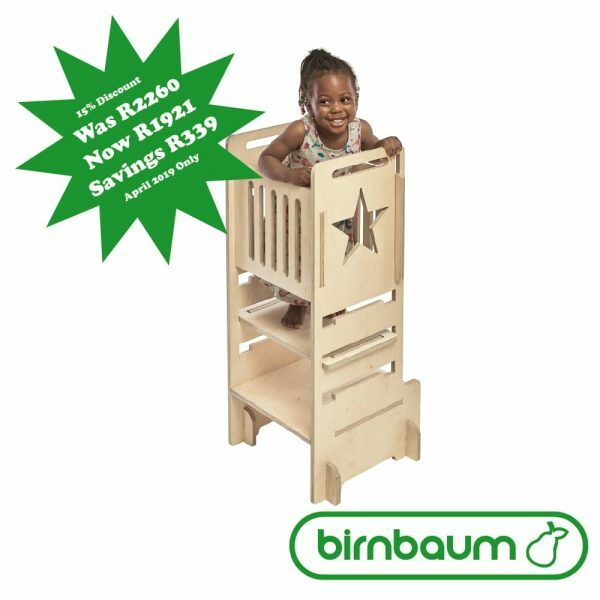 As they start getting older it is a good idea to consider investing in a learning tower or similar so that they can stand in front of the counter. Having a safety barrier at the back can help prevent falls. Once standing at the counter next to you, your little one can start learning to use the various tools in the kitchen. You can start with simple tasks such as mixing ingredients, beating eggs or cutting soft foods. As they grow and their motor skills develop you can start adding peeling, grating and cutting. Go at your little one’s pace. Let them have fun and feel no pressure. If they don’t want to do something today, they may want to try again on another day. If making smoothies, or other blended items, let them help if you have equipment which is safe for them to do so. Setting the table can be fun too! You may not get your knife and fork in the right place, but they will enjoy the process and if like Kai, will watch wide eyed to see when you pick up the utensils he has laid for you. When sitting down for your meal, thank them for helping and let them know how delicious it is. A beaming toddler is sure to be seen! 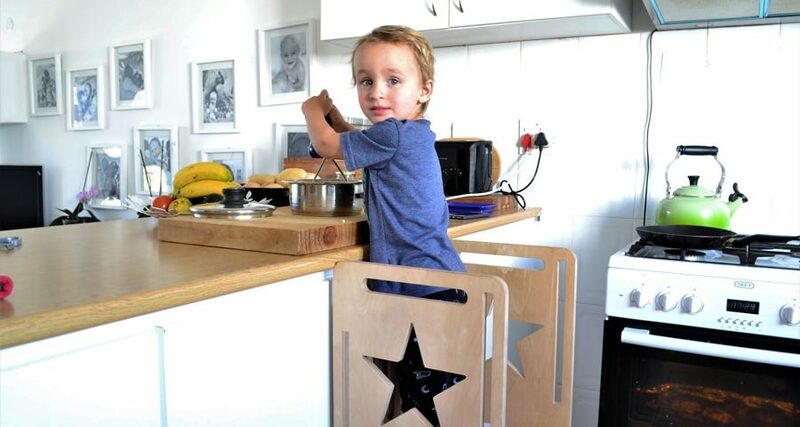 What tips would you include for your little one helping in the kitchen? We would love to hear and learn from you. Happy cooking!